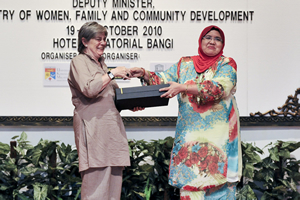 BANGI, 19 Oct. 2010 – Malaysia gives high emphasis on the development of human potential which includes providing opportunities to diverse learners made up of at risk and marginalized children with various disabilities. Deputy Minister of Women, Family and Community Development, Senator Heng Seai Kie said they include autistic and dyslexic children, the gifted, those with mental retardation as well as children from broken homes. 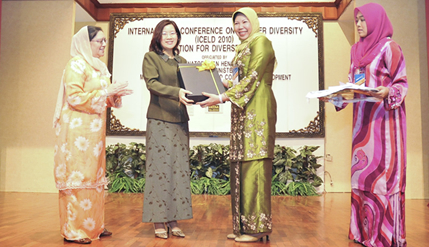 Speaking at the opening of the International Conference on Learner Diversity (ICELD 2010) organised by UKM’s Faculty of Education here today she said her ministry in line with the concept of a caring society had undertaken various programmes to fulfill the needs of individuals from diverse backgrounds. 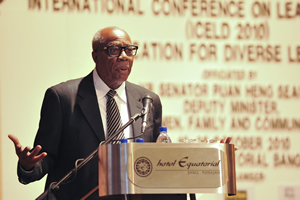 The conference a follow up to the ICELD 2008 also held by UKM’s Faculty of Education here is being attended by about 100 local and foreign participants including representatives from Unesco and Unicef. 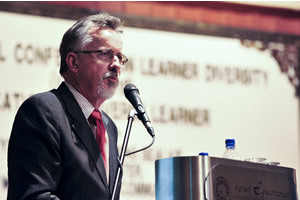 Seven concurrent workshops were also being held related to various aspects of diverse learners. Senator Heng said her Ministry in fulfilling the needs of individuals from diverse backgrounds had carried out various programmes including the setting up of centres to cater for disabled children, nurseries, vocational training and hostels for delinquents. The Ministry was fully responsible in enhancing the quality of life of children at risk to fully develop their potential and welcomed collaboration with UKM and other institutions of higher learning to share knowledge and experiences and to conduct high impact research. 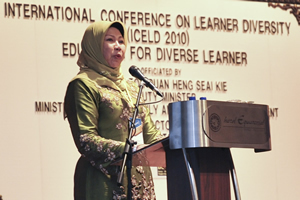 She said that Learner Diversity was related to the 1Malaysia concept being based on the concept of fairness for all in that no group should be marginalised. One way to address learner diversity effectively was to upgrade the quality of national schools through teacher training programmes which looked at the need for teachers to be more sensitive to students of varied backgrounds and abilities. She congratulated UKM and specifically the Faculty of Education for addressing learner needs through its Centre of Excellence for Learner Diversity, the Gifted Programme, The Tunas Permata preschool Programme and the Autistic Centre paving the way for the university to play a significant role in addressing learner diversity. In her welcoming speech UKM’s vice chancellor, Prof Tan Sri Dato’ Dr Sharifah Hapsah Syed Hasan Shahabuddin said UKM has started programmes related to learner diversity at both the graduate and undergraduate levels. She said that UKM was also the first university in the country to introduce and conduct the Bachelor’s Degree in Special Education which is related to learner diversity encompassing marginalised children including the gifted as well as the handicapped. 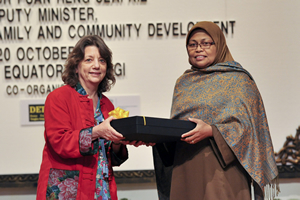 Her speech was read out by the Dean of the Faculty of Education, Prof. Datin Dr. Siti Rahaya Ariffin. As a research university, UKM gives priority to high impact research whose results could help in providing input to the decision makers. 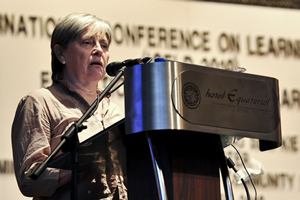 Notable research conducted by the Centre of Learner Diversity included research on the gifted children, emotional and multiple intelligence as well as the marginalized children, she said.